Something pretty amazing took place this past Monday evening that I am so excited to share with you. I'm excited because, despite how it may seem in this post, the "something" that happened didn't just happen to me. Or our family. It happened to all of us. That means you. $64, 953.04 for "Gavin's Playground Project." Over $25,000 for "Gavin's Trust Project." Over $7,000 and boxes upon boxes upon boxes of toys, art supplies, musical instruments, books and more to duPont Hospital's Child Life Department. Over $30,000 to the Gift of Life Family House which allowed a guest room to be dedicated to Gavin, a plaque in his honor in the entry way and a stone in the memorial garden - all celebrating the gift of his organ donation. $1,537 to CaringBridge, the website where I got my start writing about Gavin when he was an infant. That's a lot of love. A lot of money. And a lot of tributes to Gavin's 5 1/2 year journey. Ed and I attended a gala this past Saturday night. It was organized by a fellow duPont Mom, Kristen, who lost her child, Molly, and created the "Miracles for Molly" foundation to honor her life. Her newest project is to raise money for a sibling bereavement camp for kids, like Brian, who lost a sibling at duPont. It will be a few years until Brian is old enough to attend, but Ed and I are so supportive of this wonderful idea. The evening was called "The Art of Living Gala" and Kristen did an incredible job, raising over $20,000! She asked if she could borrow some of Gavin and Brian's art to hang in the venue, which was an art gallery. I was happy to help. 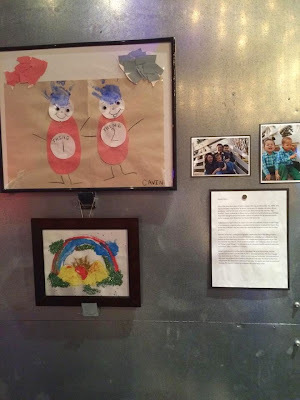 Here is their art and what I wrote about each piece and their sibling bond. There was an auction and Ed and I immediately decided to bid on a HUGE basket put together by "TheraPlay." It was filled with all kinds of art supplies, paints, construction paper, etc... and a certificate for free therapy services. We were determined to win this so we could donate it to Gavin's former classroom. We knew they would put all of it - but especially the free therapy for a family who needed it - to good use. Just today, Hope and I took a little ride over to Gavin's old school to visit his classroom and deliver the basket. I found out that one of Gavin's friends just recently benefitted from Gavin's Trust Project! She tried out a Rodi Horse one day and the teachers and therapists saw how relaxed her muscles were and how it helped her to engage more than ever in the floor activities in the classroom. Money from Gavin's Trust Project was able to purchase one for her parents to use with her at home! Hearing that really made my day - and made me feel so, so grateful. So, back to Monday evening. You might want to pull up a chair and grab a snack. This year, unbeknownst to us, Ed and I became members of the Nemours Society based on personal donations that we made to the hospital. Each year they hold a very fancy reception for the members to thank them for their donations, and we were invited. It felt uncomfortable to be "honored" just for donating. But then it got even more uncomfortable when the hospital asked me to be the evening's speaker! WHAT?!? I am truly not a public speaker. 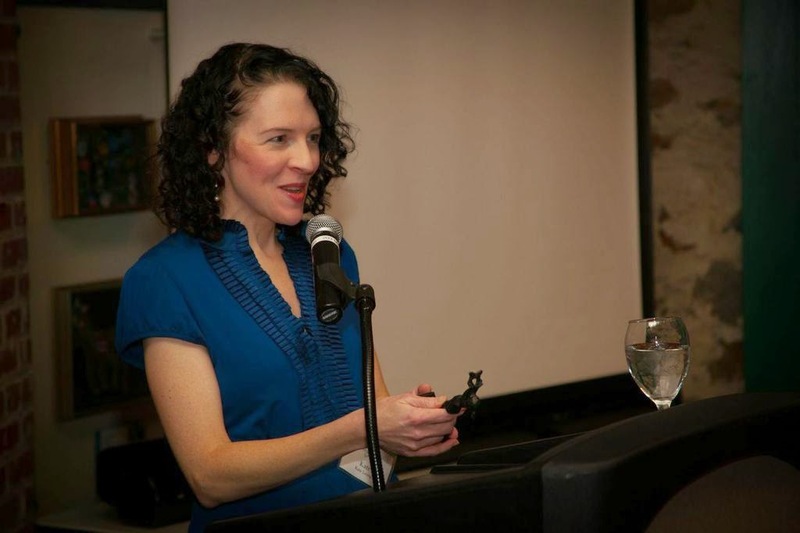 If you've heard me stumble through a speech, you're probably nodding and going "hmm mmm!" right now. I had no idea what I would say. My hospital friend told me that I could just tell our story - and explain why I wanted to fundraise. But to explain why and how I fundraised to a room filled with expert donors seemed...silly. But then - on the afternoon of the event - my speech finally came to me. Just because there were many huge donors in the room didn't mean I couldn't explain to them how their large donations trickled down to help in small ways which, in turn, made a HUGE impact on our little family. Someone might have given a large donation for medical research or for the hospital expansion or maybe even new, state of the art equipment. But as it is with any donation, big or small, there's a ripple effect. Ed and I enjoyed mingling at the event and meeting new people and seeing old friends. We were thrilled to see Gavin's eye surgeon, who we love so, so much - Dr. Sharon Lehman. Two important members of the hospital's leadership team spoke before me. 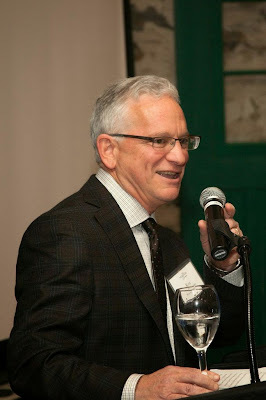 Dr. Roy Proujansky, who is the Chief Executive and Executive Vice President of Nemours. He has become a friend over the years. He would often pop in to say hi if he knew that Gavin was inpatient... and he was very supportive during the four days we were there saying goodbye to our little boy. And next was Dr. David Bailey, Chief Executive Officer of Nemours. He is the one I approached about the playground initially and he gave me his blessing and support to go public with my plea and hold a fundraiser. 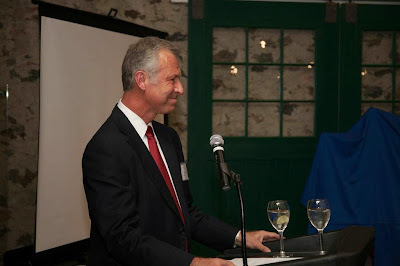 Here was my speech that evening. Be sure to make it through to the next part of the evening after my speech - that's where you come in. Thank you so much for inviting me to speak to you tonight. As always, it’s a great honor for me to be of service in any way to the hospital we love so dearly. 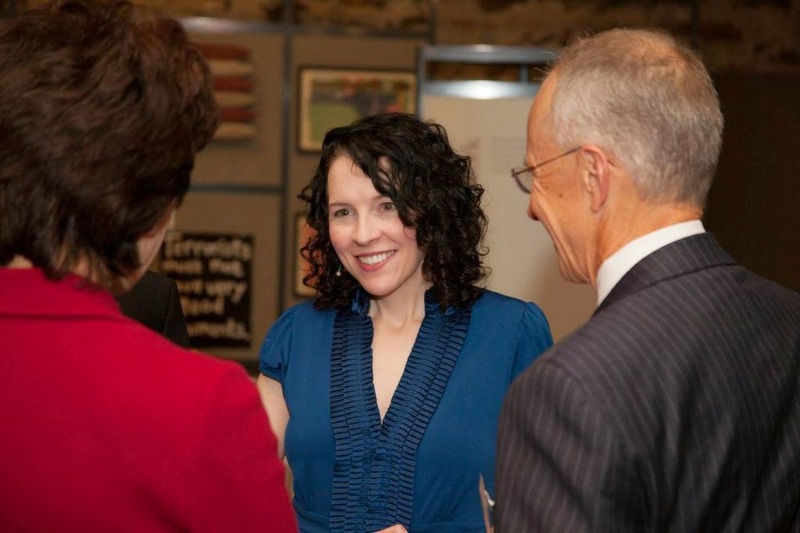 When my husband, Ed, and I found out that we were considered part of the Nemours Society because of a donation we made - we were very flattered. We had never heard of the Nemours Society and certainly didn’t give our money for any type of recognition. We donated for two reasons - and two reasons alone. One - we feel very passionate about a large project. An accessible playground. The children inside the hospital or who come to the hospital for treatment and therapy deserve to have a playground that was built just with them in mind and I intended to help make that happen. After getting a yes from the executives to go ahead, I had a fundraiser that brought in a little over $63,000. Surely not enough to fully fund the playground - but a great start. So next time you’re looking to funnel your dollars into a particular project, please remember the accessible playground. Wheelchairs don’t glide over mulch - or climb stairs - and these children are waiting patiently inside watching from the windows waiting for grown ups to make the changes necessary so they can do their job: play. But, the other - and really most important - reason why we gave our money to the hospital was to thank them... and to thank other donors, like all of you. Our first son, Gavin, was born slightly premature in 2007. He was born with very low tone and had some feeding difficulties as a result. When he was two months old, he contracted RSV which landed us at a local hospital for two weeks. When he wasn’t getting well, they transferred him to Nemours. It turned out that he had infantile botulism on top of the RSV - practically paralyzing him. I lived next to his hospital crib for close to three months. And we would continue to come back to the hospital for years for various reasons. I was always comforted that we were bringing our child to an outstanding hospital and he was getting excellent medical attention. But I’m the type of person that pays attention to and is grateful for little things. And over the years it was apparent to me that the little things along the way were made possible by donations. And those little things...made the biggest impact on our lives. You may or may not know that I write a blog called “Chasing Rainbows.” It is about Gavin and our journey with him - and about our family adventures. That blog reaches millions of people from all over the world. It is because of my readers that I was able to raise $63,000 for the playground. Donations came in from Australia and Greece - Paris, France and Paris, Texas - and most were in small denominations. $5.00 - $10.00 - $20.00. I’ve been able to write about things we’ve done to help Gavin - different therapies, alternative treatments, equipment we got for him - and it’s reached others who, in turn, were able to help their own children with some of those very ideas. The blog has been my therapy over these past six years - giving me an outlet to express my frustrations, grief, joy and gratitude. But what you don’t know is that writing online probably would have never happened if it weren’t for Nemours. During the first week of our long stay there, a volunteer knocked on the door and asked if I’d like to borrow a laptop. BORROW A LAPTOP! What?!?!? There were no iPhones at the time - and I didn’t have a computer - all I had was a phone to call family and friends to update them on Gavin’s condition. That laptop - surely made possible by donations - was my lifeline. And, in turn, my blog has become a lifeline to many others. Little things during Gavin’s long hospitalization made a big difference to me. The free tea each morning off the volunteer cart. The free washer and dryer in the Family Resource Center. Borrowed Baby Einstein movies from Child Life. These little amenities during a very stressful and lonely time made a huge impact. But the biggest impact on our lives was yet to be seen. I’ve been accused over the years of being a “helicopter Mom” which I take great offense to. I really considered myself more of a “hovercraft Mom” - they get a lot closer. Until DRONES came along! They get close AND take pictures - perfect. So it was on a beautiful April day that this drone Mom took Gavin to a local emergency room because he was snuggly. Snuggly! Having taken his first steps just a few months before, Gavin was unstoppable. He had no time to snuggle. So it tripped off my radar and off we went. Even I knew I was overreacting... but now, looking back, I realize I was guided. For it was in that emergency room that Gavin had a febrile seizure that stopped his heart. As I stood shaking and helpless in the corner of that room - watching strangers surround my little boy, trying to breathe and pump life back into his five year old body - I had two prayers. One - Please, God, let him live. Two - Please, God - just get him to duPont. When the helicopter arrived and the pilot took both of my arms and said, “Maam - I don’t let people die on my chopper” I felt like I could breathe. All I wanted was for Gavin to get to the hospital that had cared for us like family for the last five years. It quickly became apparent, after a few more major cardiac events, that Gavin would not live. Because of donations from people like all of you, the four final days we had with Gavin were beautiful. As you know, the child life department depends on donations of dollars and supplies. The things, books and ideas they shared with us - have shaped our grief journey in the most positive way. We knew we would donate Gavin’s organs. I asked the Child Life department to help me make a sign that we could attach to the foot of Gavin’s bed. They used their supplies - all donated, I’m sure - to make exactly what I wanted. It had a little flying superhero and it read “Superhero Gavin, Off to Save Lives.” A photo of Gavin that I took being wheeled into the OR for the organ harvest has been seen all over the world by millions. Thousands of people have written to me since that day to say they were inspired to either become an organ donor - or start a conversation in their house about donating their child’s organs should the unthinkable happen. So let’s recap: because of donations I was lent a laptop which allowed me to write about our story. Readers, in turn, donated over $63,000 for the playground... over $10,000 and hundreds of supplies to the Child Life Department in lieu of funeral flowers... and became inspired to become organ donors because of a sign and a story. When we brought Gavin’s then four year old brother, Brian, to the hospital to say goodbye to his best friend - it was Child Life that helped all of us through that dreadful day. Jenn from Child Life started by explaining to Brian that Gavin was going to die. She said that before we all went in to see him, she wanted to give him two little bears. One would be for Gavin - and one would be for him. She told him to whisper a wish into the bear - and then whisper the same wish into Gavin’s ear - and that wish would always remain a secret between Gavin, Brian and their bears. She also gave Brian a book called “The Invisible String” that talked about how there is an invisible string that connects all of us and it never breaks - even when someone dies. If you’re ever missing someone - wherever they are - you could tug on your invisible string and it will bring them closer to you. Then she brought out a clear plastic heart that opened - and glittery plastic gems for Brian to fill the inside. She attached a clear stretchy string so Brian could hang the heart on something when he got home. Jenn suggested that Brian could tug on this tangible heart hanging by an “invisible string” each time he missed his big brother. 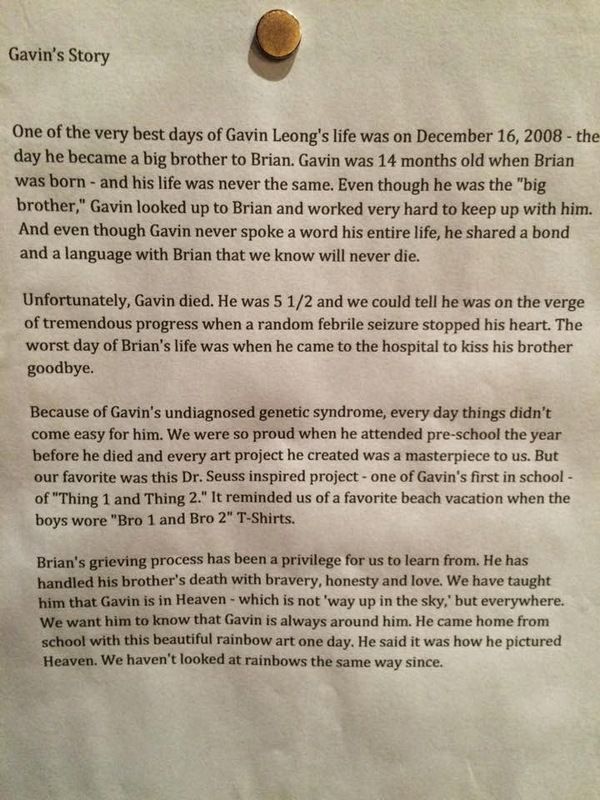 Brian moved into Gavin’s room when he died. That invisible string and the plastic heart has hung on the closet door since. And every night, as a family, we each pull the string to say goodnight to Gavin and tell him something about our day. That little brown bear? It sleeps with Brian every night. He never told us the secret that he whispered in its ear - and I hope he never does. But he does share the bear. The second year without Gavin has been harder than the first, I’m finding. Although I don’t show it outwardly (at least I don’t think I do), Brian seems to know just what I need. One day he brought the bear down in the morning and placed it next to Gavin’s picture on my desk. “Here Mommy - you can have my bear today. So in case you miss Gavin or miss me, you can look at it or hug it or give it a kiss and it will make you feel better! But I’ll need it back at bedtime.” He’s continued to do this every day since for the last several months. If you could see this bear - picture the cheap stuffed toys you pull out of those big claw machines? It’s like that. Honestly, a thousand dollar donation could probably buy 3,000 of these bears. And I bet it would buy the same amount of plastic hearts. But I’ll tell you what - the bear and the plastic heart are two of the most valuable items in our home. I would grab them in a fire. And the ripples will continue. Brian can one day read “The Invisible String” book and explain the bear to his little sister, Hope, who surprised us with her existence the very day that Gavin died...and was born 7 months later. I know that we were invited here tonight - all of us - so the hospital might thank us for our donations. But I really feel that I am here to thank them - for caring for our family since the day we walked in with our infant son. And to thank all of you - because your donations, whether it was one time or many over the years, trickled down and profoundly affected and changed our lives. "Thank you, Kate. Thank you for sharing your story. We are so sorry for your loss. We feel a part of your pain, but also a part of your happiness and hope. That's how it feels to be part of Nemours - you feel a part of the families that are here every day, sharing their highs and their lows, their laughs and their tears. And you never really let go of those families or their stories. They stay with you. Now we come to one of my favorite parts of this annual event - the presentation of The Inspiration Award. This honor is given to an individual who personifies philanthropy: generosity, willingness to approach others to join them in giving, and a commitment to the community. Tonight we recognize someone who has truly touched our hearts and who has been an amazing advocate for children and for Nemours. 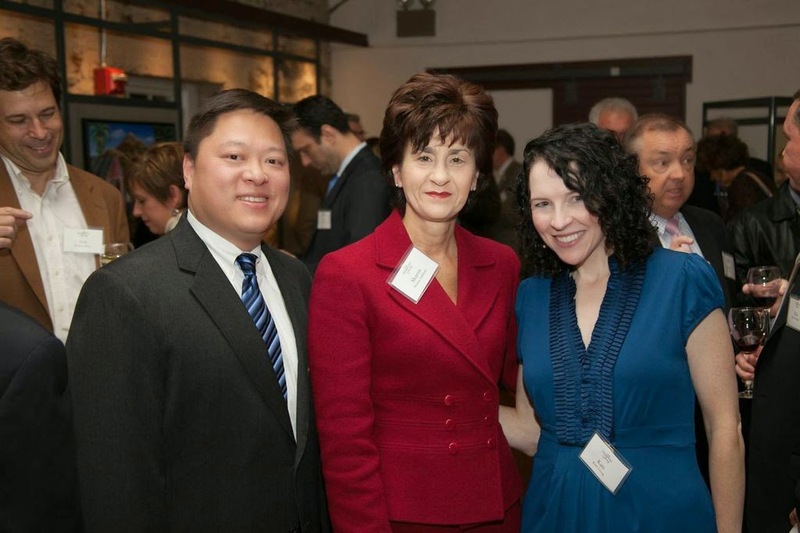 The Nemours Fund for Children's Health is delighted to present this year's Inspiration Award to Kate Leong. Kate was extremely modest in telling her story. But in a moment when everyone would have understood if she took "time off" or if she emotionally retreated, she continued to advocate for children and for the hospital. Her goal is to fund an "All Abilities Playground" at the hospital, where all children would be able to play. Through a special event and outstanding outreach, Kate, her husband, Ed, and her family raised more than $60,000 for this new project! Kate shares her story whenever she has the chance, trying to support and help other families who are having similar experiences. She has assisted with the past two Radiothons, which is one of our largest fundraising events each year. She is always looking for ways to improve the patient experience here at the hospital, where she spent so many days with her son. 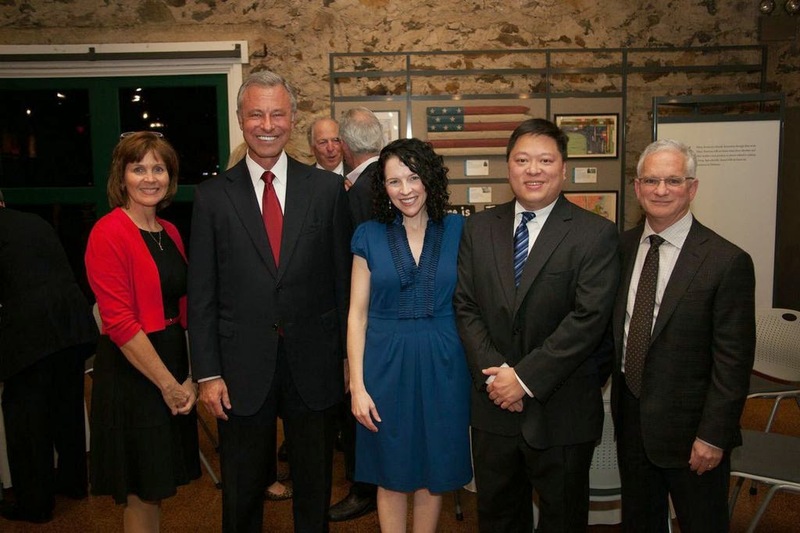 In addition, Kate and Ed are members of The Nemours Society." And then she said she knew it had taken me by surprise (that would be a GINORMOUS understatement - I was stunned. Completely, utterly, overwhelmingly stunned.) and asked if I wanted to - gulp - "say a few words." I truly was speechless and, in typical fashion, had to make a joke "thanking the academy and my family and my agent..." so I could gather my thoughts while they laughed. I think they laughed. God, I hope they laughed. I know I said at least ten times that I felt the award was so unnecessary. It didn't feel like it belonged to me. The true recipient of the Inspiration Award is Gavin. He is behind all of this. And all of you, because... well, I'm getting to that. The actual award is a bronze sculpture they had commissioned of a child releasing a butterfly - and it is stunning. And extremely symbolic. The child signifies the pediatric mission of Nemours and the butterfly symbolizes change, freedom from disabling conditions... and hope. After I stumbled through my thank you, the evening ended. As I stood there, person after person waited to talk to and congratulate me. More importantly, many asked how they could help to get the playground project completed. I directed them to the folks in fund development who are handling the whole process (which is still in planning mode) - but I can't wait to hear if anything comes of all the interest!! Driving home, I was still in shock. Ed and I talked about it the whole hour drive. You know, I really do feel like this award was unnecessary. When I looked up the past recipients I was stunned - and so, incredibly honored to be in their company. I'm just shocked that they chose me. 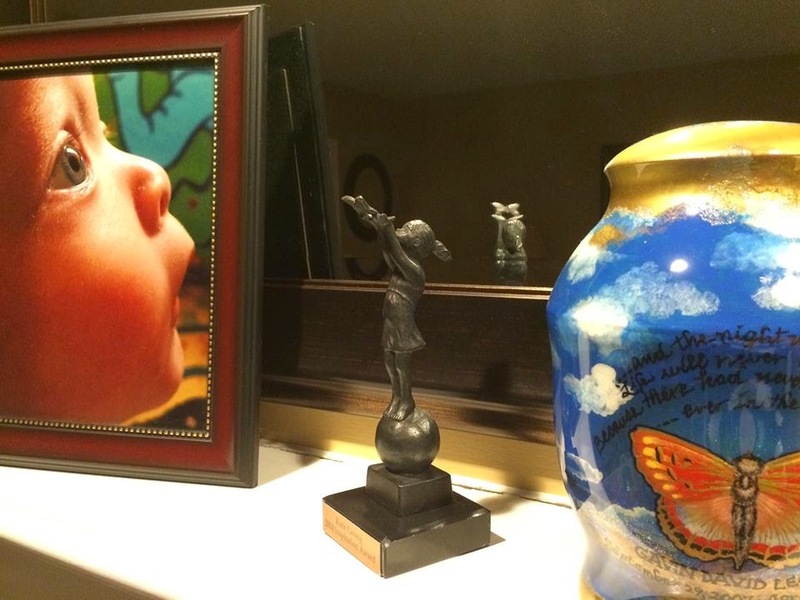 But I can't lie - as I look at the award, which now has a home on the mantle... right next to Gavin's beautiful urn - it is suddenly so important to me. Every time I look at it, I remember who it's really for - my family and all of you. If it weren't for all of you, there is no way I could have raised all of that money for those charities and causes. Just no way. You have been so generous with your donations and have trusted me - a total stranger - which means so much. But even if you never donated a dollar, but still came here to read and cry and celebrate and encourage - I want you to know that that means just as much. You might think I am here to help and inspire others to get through tough times... but many, many times I have leaned on all of you. And you've always been there. I've said this before - and I don't mean any disrespect - but I really thought readers would drift away after Gavin's funeral was over. Or maybe even after Hope was born. But you just keep coming back. I feel so connected to all of you and I'm so grateful that you've connected with my little family. This Inspiration Award is partly dedicated to each and every one of you. I know my Dad would be very proud of me in this moment. Proud of how I've handled Gavin's death and proud of how Ed and I have handled Brian's grief and proud of all the philanthropy. My Dad was always generous with everything - time, money, resources, advice, positive encouragement and love. He was so humble his whole life - never wanting recognition for things. This is how I want to raise our children. I want them to be generous without looking for anything in return. I want to one day explain why Mommy got this award and tell them that it symbolizes that you can do really difficult things even when things are really difficult for you. And that, no matter what you do in life - how big your accomplishments are - how much money you make and how many awards you receive - your biggest rewards will come from inside your own home. They are the people you should look to impress the most. They are the people from whom you should draw your inspiration. Being a Mom is the most important work I will ever do. Gavin... this is all for you. My promise to you, every day, is that I will continue to honor your life by setting a good example for and being a good Mommy to your brother and sister. I'm trying my best, buddy. You are an inspiration to so many. You (and Gavin!) deserve that award more than anyone else in the world. Thank you for sharing every part of your story, the good moments and the painful ones. For giving of yourself selflessly even when your world was crumbling around you. So many have been and will be affected by your generosity, drive, and kindness, and those ripples will continue throughout many families and communities as a result. Congratulations! Not only for your award but for the chance to share Gavin's story with so many potential donors to Gavin's playground. They couldn't have picked a kinder more generous recipient. I am continually amazed at what a poignant write you are, your stories touch my heart. I thought that after Gavin's funeral you might stop your blog and selfishly I am thrilled you haven't as I enjoy hearing the adventures of your family and the ways that Gavin tugs on his end of the Invisible String. Kate, as I write through the tears, I am always amazed at your strength and willingness to reach out and help people. You are so very correct that every penny can help someone who in turn will help someone. Thank you for your blog and your willingness to share with so many strangers your life. Congratulations on your award. You are an inspiration to your readers. You've brought more generosity and kindness into my life. Now for a silly question: Where is your blue dress from? I love the color and it is beautiful! Kate, congrats on your award. Seriously congrats. I know you do not feel worthy but because of your love of Gavin and his of you (and your family) you have been able to pay that love and care forward. Congratulations to you and Ed for all your hard work for others. I have been following your story from the beginning. I have a son with Autism and Epilepsy and know how hard it is to have to be at the hospital many times and therapy. My son is 11 now and doing well. His older brother has some issues also ADHD, every day is a blessing . I am so happy for you and Ed that Brian and Hope are a part of your lives as well. Their big brother Gavin is always watching out for them. Keep up the great work . Your speech brought me to tears as it really touched my heart. I am a crafter and have been making my version of teddy bears called BFF Warrior Bears for children and parents who can use a friend to hug. 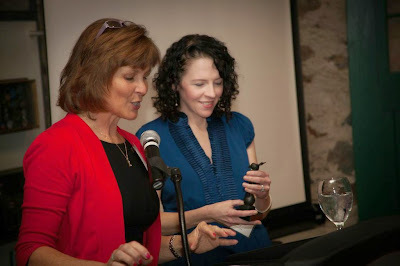 Beautiful, brilliant, funny speech, and well-earned recognition for you and your tireless efforts. 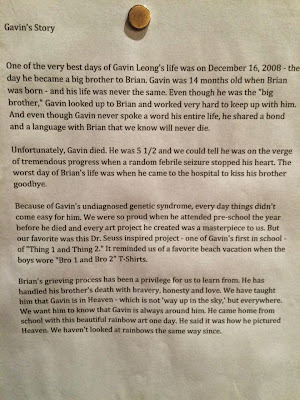 Gavin lives on and helps others through you!